H-day -4: what makes it a Higgs? 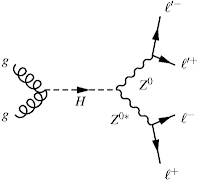 In talk shows and fashion magazines the Higgs field is being described as aether filling the entire space, while the Higgs boson is a wave propagating in that medium. This is a useful visualization, but to answer the question from the title we need a better one. A more precise definition is that a Higgs particle is a spin-0 boson whose coupling to other particles of the Standard Model is proportional to their masses. In fact, Higgs is not just another particle than no one ordered; its existence is crucial for the consistency of the theory. The reason is that gauge bosons and chiral fermions are massless in their natural habitats (like photons and gluons), and giving them mass is a serious intervention referred to as local symmetry breaking. Without the Higgs boson (or something else playing the analogous role) a theory with a broken local symmetry loses its predictive power at high energies. Incidentally, the way the Higgs boson is now being discovered at the LHC has little to do with that important role. In a high-energy hadron collider Higgs is dominantly produced by a fusion of 2 gluons, and is most easily observed via its decays into 2 photons. The couplings to photons and gluons are not really what defines the Higgs, but rather a byproduct induced by quantum corrections. In fact, other scalar particles could enjoy the same couplings without having anything to do with the mass generation (radion is one example). Thus, observing a resonance in the diphoton channel provides a circumstantial evidence in favor of the Higgs boson (given the rate is close to what the Standard Model predicts), but does not directly prove the higgsy nature of the new particle. Fortunately, we can test whether or not we're dealing with a Higgs. Already now the LHC has a potential to probe the Higgs coupling to W and Z bosons, which are directly related to the mechanism of mass generation. In particular, the LHC is sensitive to the h → ZZ* → 4 leptons decay, where the invariant mass of the 4 leptons should reproduce, to a ~GeV accuracy, the mass of the Higgs. In the 2011 data ATLAS saw 3 events near 124 GeV, while CMS saw 2 events near 126 GeV. It is likely that these events indeed originated from a decay of a 125 GeV Higgs boson, however at that point it could have easily been a statistical fluctuation of the background. On the other hand, the 2011 searches for the h → WW* → 2 leptons + 2 neutrinos decay showed some deficit of events relative to the hypothesis of a 125 GeV Standard Model Higgs. So the jury is still out. Adding the 2012 data should more than double the statistical power: on the 4th of July CMS will update both channels mentioned above, while ATLAS will update the 4-lepton channel only. If they report a signal, that will be a strong evidence that the observed resonance is a Higgs particle. And that is only the first test. In the near future, the LHC will be sensitive the Higgs decays to b-quarks and tau-leptons, as well as production processes via the Higgs couplings to W and Z bosons. Studying the rate of all these processes we can determine whether the new particle indeed couples to mass. Then we'll know whether it's the Higgs, or just one Higgs from a larger Higgs sector, or an impostor. H-day -5: heaven or hell? In about 125 hours ATLAS and CMS will present new results of the Higgs searches, including about 5fb-1 of data collected at 8 TeV energy in 2012. If you read blogs you know that a fireworks display is promised on the 4th of July. It is not clear, at least to me, if either of the 2 experiments will pass the 5 sigma fetish. But it does not really matter. The 2011 data were already showing a solid evidence of a Higgs-like particle with the mass near 125 GeV and decaying to photons. What's going to change next Wednesday is that the status of the Higgs will be upgraded from "almost certain" to "beyond reasonable doubt". Experimentalist's hell: no Higgs is found at the LHC. The experimentalists feel awkward, politicians ask difficult question, the public suggests to check for loose cables. Meanwhile, theorists spam the arXiv with countless Higgsless, invisible Higgs, unHiggs, or buried Higgs models. Since last December this scenario has become very unlikely. Theorist's hell: Higgs is discovered, perfectly matching the predictions of the Standard Model. The public cheers, everyone pats experimentalists on the backs, Gary Taubes writes "Nobel Dreams II". A few years later, the last particle theorist leaves his office, switches off the light, and returns the key. Heaven for all: Higgs is discovered, but it's different than the one predicted by the Standard Model. This is the best of all worlds, where the measured Higgs properties clearly point to the existence of other, yet unknown particles within the reach of the LHC. For the rest of the century theorists and experimentalists work hand in hand to pinpoint the true theory of fundamental interactions at the weak scale. Which of the last 2 scenarios is true will not be decided on the 4th of July, but the odds may be affected. What if dark matter is no WIMP? There is a dozen of dark matter direct detection experiments currently in operation all over the world. Most of them are hunting the so-called WIMP: a particle weakly interacting with nuclei and having the mass in the GeV-to-TeV range. This WIMP chauvinism has two reasons. One is that, not so long ago, everybody knew for a fact that the dark matter particle is the lightest neutralino in the constrained MSSM, therefore its mass and interactions were constrained to a small window. Things have changed in theory since: we're aware of many more well-motivated dark matter candidates in a wider mass range. The other reason is practical. Today the dark matter particles in our galaxy move very slowly, about 200 km/sec on average. A 10 GeV WIMP hitting a nucleus with the mass close to that of the Higgs produces a recoil of the latter on the order of 1 keV, barely detectable above the instrumental noise. For this reason searching for dark matter lighter than 10 GeV is challenging, and at some point becomes impossible using current techniques. If dark matter is not a WIMP the current direct detection efforts are doomed. But not all is lost. This new paper by Essig et al argues that, using available detection techniques, the hunt of dark matter can be taken to a completely new territory. Namely, it turns out that it is possible to search for an MeV-scale dark matter particle, provided it interacts with electrons. When a light dark matter particle scatters on a heavy nucleus, the fraction of the initial energy transferred to the nucleus is suppressed by m_DM/m_N, which leads to negligible recoil energies when dark matter is sub-GeV. However, the kinetic energy involved in the reaction is larger; for example, it is of order keV for a GeV dark matter particle which is more than enough to ionize the target atom. Now, in some dark matter experiments it is possible to detect that a single atom in the target became ionized. 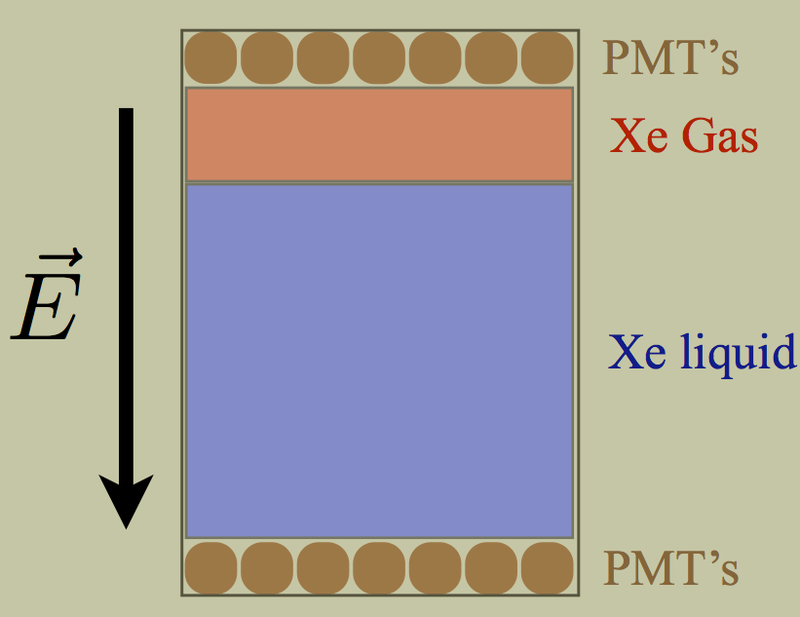 In particular, the Xenon10 and Xenon100 experiments use a tank filled with liquid xenon to which an electric field is applied. 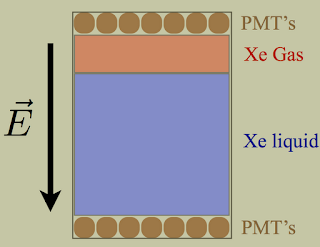 Thanks to that, an electron kicked out from a xenon atom drifts up, and once it reaches the gaseous xenon at the top of the tank it accelerates and produces a lightning flash registered by the photomultipliers. 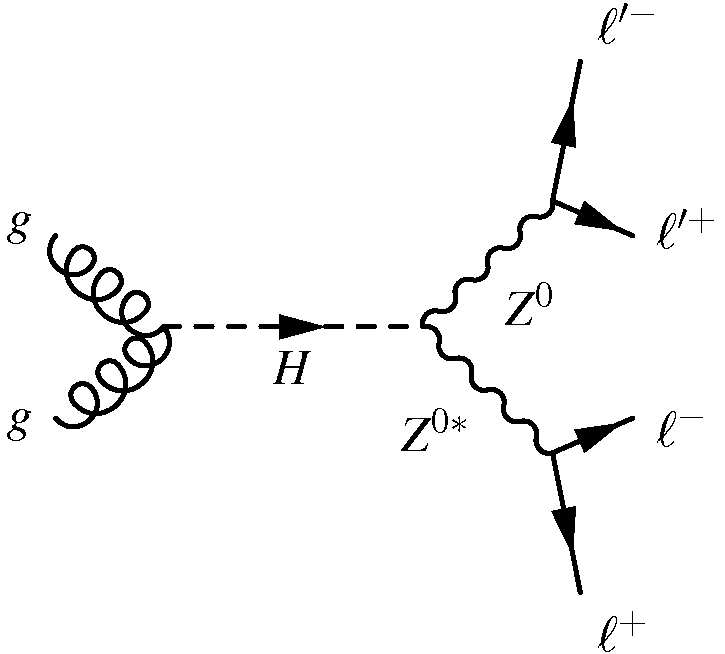 Thus, light dark matter interacting with electrons should produce events with a small number of ionization electrons. Such events are usually discarded by the experimenters, because the typical WIMP produces more ionization and also a strong scintillation signal when the recoiled atom is de-excited. 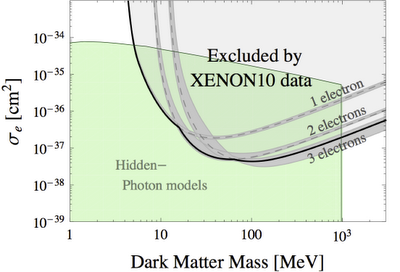 Nevertheless there exist old Xenon10 calibration data where the trigger was sensitive to even a single ionization electron. These data can be recycled to produce bounds on dark matter in the MeV-GeV mass range. 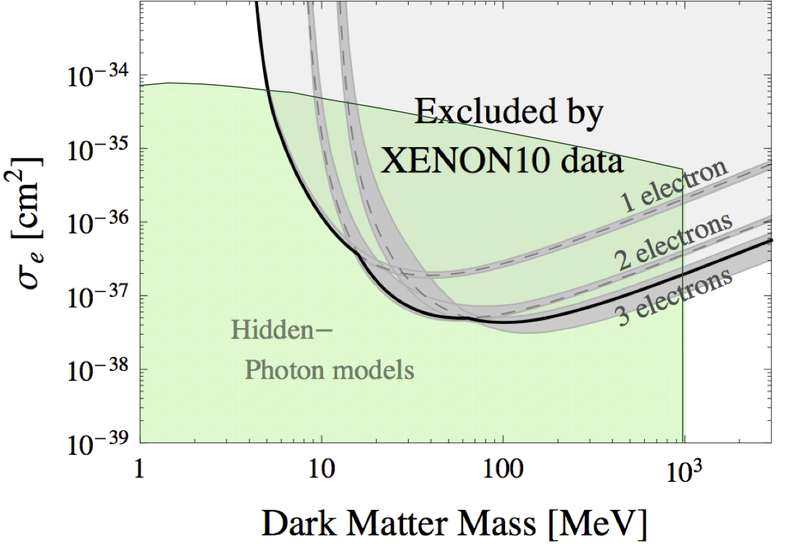 Based on events where 1, 2, and 3 ionization electrons were registered one can obtain the following limits on the scattering cross section of dark matter on (free) electrons. As one can see, the constraints bite into the virgin parameter space of models where MeV dark matter interacts with us via a "dark photon". What is most encouraging here is that just 12 days of data collected for a different purpose can give useful constraints on light dark matter. Hopefully, similar analysis will be done in the future by the Xenon100 and LUX collaborations, leading to a better bound (or a signal :-). And, who knows, maybe one day we'll have an experiment completely dedicated to direct detection of light dark matter. Although, for the moment, the WIMP remains the theoretically favored dark matter candidate, it's high time to take the alternatives more seriously.